A screening of a Not In Our Town film can help you and your community open the dialogue about preventing hate and helping all people feel safe. Here are some helpful hints for coordinating your own screening or event. Get the word out about your community screening. Our Action Kit  features downloadable posters and flyers you can use to publicize your event. Download discussion guides and conversation starters  for a variety of audiences. Panelists: Be inclusive and invite people from a variety of backgrounds, professions, and community groups. Suggestions include: educators, students, law enforcement, union members, religious leaders, human rights organizations, civic groups, elected officials and journalists. Have a pre-screening discussion with the panelists. We've found it's helpful to have the panelists view the film beforehand to determine their own angle on the film, and prepare any additional comments they may like to add to the discussion. Moderator: Be sure your moderator is articulate and has knowledge of the subject. Communities report success with moderators that are neutral and non-polarizing, and who can resonate with a diversity of audiences. Consider news personalities, elected officials, educators or clergy to serve as moderators. Building the crowd: Call on community organizations and schools to help you organize the event. Make an effort to promote the screening online through community groups' websites, local event websites, Facebook, and Twitter. Add the screening to the community events calendar featured on your local television and radio stations.In the print world, look for advertising, calendar listings and articles in your local newspaper, the alternative paper. Press: Be sure to invite reporters to cover the screening so that your event reaches even more people than those who attend. Recruit community members who would be willing to write a letters to the editor in local newspapers before and after the event to encourage the community to attend and following to recap the event's success including details of the screening and next steps. 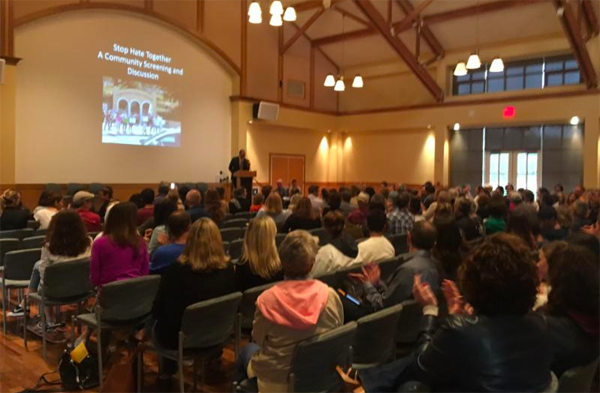 If you plan to build a Not In Our Town movement with your screening, be sure to collect contact information of those in attendance, making sure to keep individual contact information secure. It's especially helpful to ask people to note their strengths/connections to the community and how they may like to be involved in the movement. Selling posters, buttons, or other materials can be a great way to raise funds for your group or the NIOT movement. Check out the Action Ki t for free posters and other resources you can download. Good potential screening locations include your public television station, local theaters, university/college lecture halls, school auditoriums, churches or synagogues, libraries, union halls, and government buildings. Be sure to spend some extra time promoting the event to those who work, live or frequent the building that will host the screening. At the forum, you may decide as a group to take action against hate activity in your community. Some towns have even passed a Not In Our Town proclamation  about how they will work together to oppose hate violence, and release this proclamation to the media. Be prepared to channel people to local organizations already working against hate violence, such as the human rights commission, and have information about national anti-hate organizations available as an additional resource if people are inspired to carry on the work. If you plan to build a Not In Our Town movement, it's a good idea to have a follow-up meeting scheduled to encourage attendees of the screening to participate. Have fliers available advertising the meeting, encouraging attendees to invite others. We want to know what you've done! Update your community profile on NIOT.org  with a recap of the screening and next steps planned. NIOT Video Portal  — Browse trailers and clips from over 200 videos produced by NIOT, purchase a DVD and screening guide or visit our YouTube channel. Videos by Category  — In addition to the original Not In Our Town story, our site features a collection of other videos  that might be effective in your community. About NIOT  — Learn more about what we do and all the ways you can get involved with the NIOT movement.